While marble floors are delicate, they are not as hard to maintain as some may think. In fact, the main trick to keeping your marble floors looking great is keeping them clean and dry. Ensuring your marble floors have a strong seal will help avoid stains or etches into the marble’s surface. 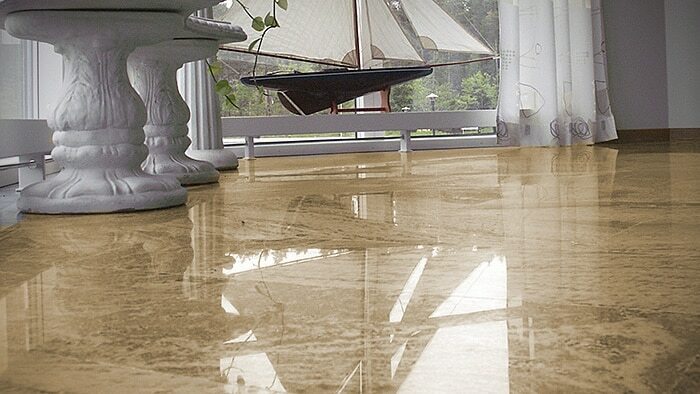 -Always Seal Your Marble: Marble floors are porous, making them more susceptible to stains than other stones. A strong seal will help to avoid this issue and improve the look of your stone. -Don’t Let Stains Sit: Even with a strong seal, it is important to clean any spills immediately to protect your stone. Acidic substances are especially bad for your marble and should be addressed as soon as possible to avoid damage. -Only Use Specialized Cleaners: Neutral pH cleaners, like these, are safe for your marble floors. Most multi-purpose cleaners are not safe to use on your stone. -Do Not Leave Moisture: After you clean your floors, it is important to follow the cleaning up with a dry. You can use a simple cloth to achieve this goal. -Bathroom Care: Marble in bathrooms is especially difficult to keep dry. We recommend using bathmats and rugs to cover the area directly outside of your shower and bath. Additionally, wiping the floor after each shower to avoid the humidity seeping into the stone. -Don’t Let Dust Build Up: When you allow dust to build up, you are opening the door for your marble floors to take on scratches that can leave your marble etched. We suggest using microfiber mops on your floors to avoid pushing the dirt deeper into the floors. -Furniture Should Be Safeguarded: Moving furniture on marble floors is a main source for etching and deep scratches. This can be avoided by applying felt pads under the legs of your furniture. -Use Barriers: Whenever you have heavy furniture, such as, tables, large planters, TV stands, etc. try to use rugs, mats, or any other barrier you can to protect the marble. -Regular Professional Deep Cleaning: Finally, if you want to extend the longevity and appearance of your marble, it is recommended to have regular deep cleanings. This will ensure your floors last, protecting your investment.